Yesterday we saw what must be the world’s most used Dodge Viper, with 190,000 well-worn miles on the clock. I think it is fair to say that at least 70 percent of those miles have been burnouts. 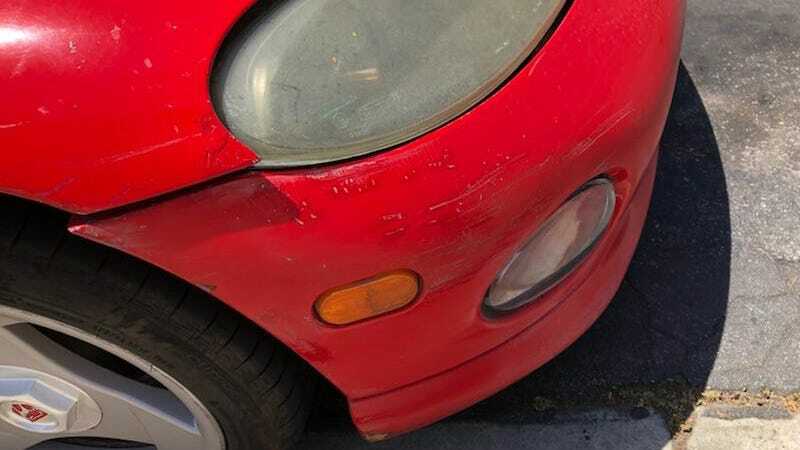 Taking one quick look at that car, I think it’s a reasonable guess that the vehicle as a whole has likely averaged, let’s say 50 miles per hour over its whole lifetime. Its rear tires have probably averaged 110. There is simply no way that this Viper, all V10 and no traction control, is owned and beloved by the burnout champion of southern California. But! Is it the car that has done the most burnouts? That’s a tough question. One might imagine that there’s an El Camino out there, somewhere, that did a burnout off the assembly line and did not stop, ever, in probably the good 30 or 40 years it had on this Earth. The owners probably changed out the rear tires by jacking the car up and swapping them while the car was running, just to keep the burnie going. Maybe I’m wrong, though. Maybe there’s a Morgan 3-Wheeler or a Ford Falcon that holds the most-burnout crown. What do you think it must be? Who Is The Most Miserable Person On The Road Right Now?